Pastoral is a finalist for the Rogers Writers’ Trust Fiction Prize, along with The Confabulist by Steven Galloway, All Saints by K.D. Miller, Girl Runner by Carrie Snyder, and All My Puny Sorrows by Miriam Toews. There are a lot of award lists out right now, but since I have already read two of these, I thought it would be fun to read the other three. adjective 1. (especially of land or a farm) used for or related to the keeping or grazing of sheep or cattle. 2. (in the Christian church) concerning or appropriate to the giving of spiritual guidance. noun 1. a work of literature portraying an idealized version of country life. Lowther Williams greets Father Pennant upon his arrival. Lowther was the previous priest’s ‘housekeeper’, and he is hoping to keep the job. In fact, his happiness depends on it. He is 62 years old, and he is expecting to die at the age of 63 like his father did before him. It is the family curse. He wants to make sure this new priest will be suitable for the task of last rites and presiding over his funeral, and he goes to some extreme lengths to find out. But Lowther wanted to know a little more. He wanted to catch a glimpse of something more deeply hidden. Robbie claims to be in love with two women and he cannot choose between them. He has even confessed to his fiancé, Elizabeth, with the hope that she will still agree to marry him, knowing that he will continue to carry on with Jane. Elizabeth and Jane both need to decide want they want for themselves. They come up with a wacky plan to see which of them he loves more. But, do either of them really want Robbie that much? How can Elizabeth know that he will not continue to fall for other women in the future? Is it even possible to love two people equally at the same time, as Robbie claims he does? And, the big question in everyone’s mind is; Will the wedding still take place? And although it was unusual for him, he began to contemplate his behavior. Had he, perhaps, done wrong despite doing things for love? Was love not the highest virtue and good? ‘Listening to herself’ brought neither comfort nor certainty. What it brought were questions about herself, about her capacity to forgive, about her ability to imagine the worst and yet to go on in a way that would allow her the self-respect she needed to survive. As Father Pennant roams the countryside, and carries out his pastoral duties, certain strange events and his musings on Nature have him re-examining his Faith. It occurred to him that Barrow itself was neither good nor evil but was, instead, animated by whatever it was that animated the land, the thing that animated each and every one of them and, so, revealed itself in its hiddenness. In fact, one felt, or he felt as he walked – blasphemous though the thought was – that God was only an aspect of the hidden, an idea brought into being by man in order to point to a deeper thing that had no name and reigned beyond silence. For an extremely thorough and insightful review, visit Kerry On Can Lit. She talks about what makes this book so Canadian, and has done her research on the origins of the cover art (a painting by a Nova Scotian artist), the meanings of names used in the book, and references to literary greats such as Wordsworth and Hardy. As well, in the comments, André Alexis has added his own explanations and clarifications, including further insights into the musical elements of his novel. After I finished reading Pastoral, I read ‘A Note On The Text’ at the back, and discovered that Pastoral “is, in part, an homage to Beethoven’s Sixth Symphony, the Pastoral Symphony”. The novel’s chapters follow the logic of the five movements in the symphony, which I think is very cool. I do wish I had known before reading the book, although maybe me searching for musical clues would have taken away from my enjoyment of the story. The last paragraph of Alexis’s comments on Kerry’s blog explains both the meaning of the end of his novel and the Kafka quote at the beginning, and ties them together. It is very interesting, but I recommend reading the book first, unless you are not bothered by spoilers. He goes on to say that “at the end of the novel, one can’t quite be sure what is real (Love? God?) or what is illusion (Nature? Marriage?)”. This real versus illusion theme reminds me of The Confabulist, which questions the reliability of what we see to be true. Pastoral is a delightful, contemplative story. In simple, clear language, it explores the ideas of life and death, love and Faith. I think it would appeal to a wide audience, and I hope being a finalist for the Rogers Writers’ Trust Fiction Prize brings it some extra attention. I would love to read more by André Alexis. Do you believe someone can be in love with two people at once? Do you think you can have a successful marriage without love? Do you think it is possible to continue to be a priest if you have lost your Faith in God? Check out this conversation between Carrie Snyder and André Alexis on writing and their respective books for the 2014 Writers’ Trust Fiction Prize. This sounds like a really great, thought-provoking book. And that cover is gorgeous! Once you’ve seen the cover of this book, it’s hard to forget it! It’s also very fitting. How fun to read a short list of finalists… do you plan to let us know your choice for the prize? I think it’s perfectly possible to be a priest and not believe in God… a priest might also believe in the importance of spiritual contemplation, or spiritual community, or something that addresses the human soul in a different way. 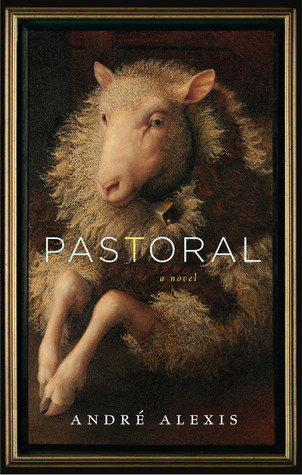 I will put Pastoral on my list. Thank you! I think I agree with you. The priest just might not want to advertise the fact that he doesn’t believe in God. If I could finish the books in time, I might hazard a guess, but the winner is being announced on November 4th (I think), so I might not make it in time. I still want to read them all, though. Two more to go, but I’m waiting on the library. Both are coming from another library system, so I don’t know how long it will take. Very interesting to learn that the chapters follow the logic of Beethoven’s Sixth Symphony, but I agree it may have been too distracting to know that while reading the book. Yes, in hindsight, I think I’m glad I didn’t know. It did make me think more about the book, and appreciate it more, after I was finished reading it. Ooh, good to know you liked Childhood. I know he has a new one coming out soon, but I thought I might like to go backward first. Also, on her blog, Kerry mentioned that if you liked Childhood, then you are likely to like Pastoral. Although there are some things happening in the book, it probably isn’t a good choice if you’re looking for a lot of action, deep secrets, or large-scale scandals. I was surprised to see that this book is only 160 pages long. Based on your and Kerry’s reviews, I would have pegged it at about double that. It sounds like a lot is packed into the book, and very successfully so. And the cover is, indeed, very memorable. Kerry’s reviews are always very thorough. I don’t know how she does it. But, yes, it does seem longer than 160 pages, even after reading it. And, the author sure took care to pack a lot of his own elements into the book, even if you don’t notice they’re there! I am intrigued by this, yet at the same time,after reading both reviews, am having a hard time grasping what it is about. Still, I’ll look for it. Simply put, it is a story of a small town and it’s quirky characters. A priest moves to the town and becomes acquainted with it, it’s people, and their stories. The characters and the priest contemplate the ideas of love and Faith. There is nothing grand about it until you realize all the work put into it by the author. I think I’d like it. 160 pages? Sounds like a Novellas in November contender. ..